Quick! Name the chief operating officer of Tesla. You can't. Because that was a trick question. 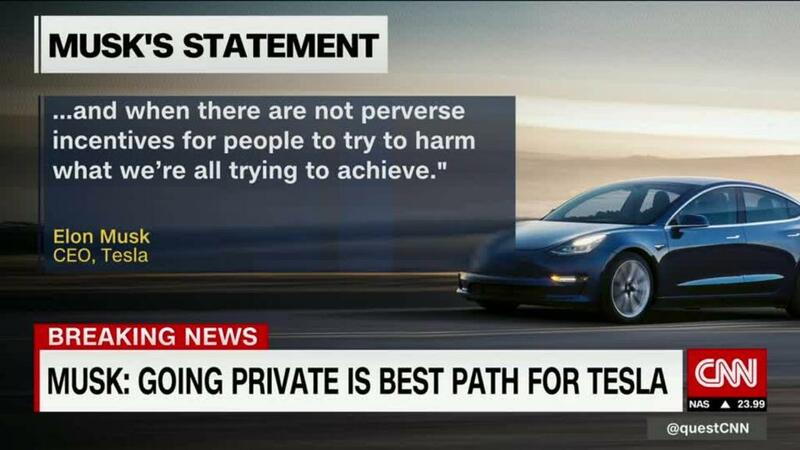 Tesla (TSLA) has no COO. And some financial experts think that's a big problem, especially since there are so many questions about the company's future. Having another high-profile leader that Wall Street respects, like Sheryl Sandberg at Facebook (FB) for example, could give Musk the freedom to innovate and take risks. Meanwhile, the COO could run the company's operations, letting investors breathe easy. Another senior leader may be needed now that Tesla is worth about $60 billion-- more than GM (GM) and Ford (F) and making Tesla the most valuable US auto company. Other successful founder-led companies have cultivated deep management benches. Google, now known as Alphabet, brought in tech veteran Eric Schmidt to be CEO before its IPO, for example. Microsoft's Bill Gates had Steve Ballmer and then Satya Nadella take over. Apple (AAPL) CEO Tim Cook had been COO for several years under Steve Jobs. That meant that there was a clear succession plan once Jobs, who passed away in 2011, was no longer able to serve as CEO. What's more, Jobs had been CEO of animated studio Pixar until it was bought by Disney (DIS) while also serving as CEO of Apple. If Jobs did not have Cook at his side, Wall Street might have been more concerned about a leadership void at Apple.